West Central Initiative and the Bicycle Alliance of Minnesota (BikeMN) invite area adults to participate in the Walk! Bike! Fun! Ambassador’s Program Training on February 1, 2019 at the Fergus Falls YMCA, 1164 Friberg Ave., Fergus Falls. The lessons and activities in this half-day training will equip volunteers to plan and organize engaging and fun events for youth so that there is an increase in safe walking and biking in their community. This free training is from 11 a.m. to 2:30 p.m. and includes lunch. Register at bit.ly/WBFAmb-Fergus. The goal of the training, which BikeMN created in partnership with Minnesota Safe Routes to School and Minnesota Department of Transportation, is to continue to grow the local momentum for biking and walking education. With activities from this program, local volunteers will have what they need to help educate students about traffic rules and regulations, potential traveling hazards, and skills needed to walk and bike safely through their community. West Central Initiative’s Planning Director Wayne Hurley sees this training as a great opportunity for communities and school districts to implement some of the easily doable ideas in their Safe Routes to School plans. “These activities, such as organizing a walking school bus or bike train to get students safely to and from school, setting up pedestrian/bike rodeos, providing youth bike education presentations and more, are growing in popularity and now the region will have volunteers on hand to support the demand for these initiatives and to build capacity around what’s already in place through local schools and organizations,” he said. (You can see the region's Safe Routes to Schools plans here). Studies show that children who walk and bicycle to school are more physically active, have improved mental health and lower odds of being overweight or obese than students who are driven or bused to school. Additionally, strong evidence connects physical activity to improvements in attendance rates, classroom behavior and student academic performance – including grades and standardized test scores. “It’s awesome to see volunteers so excited about growing the biking and walking movement in their town. 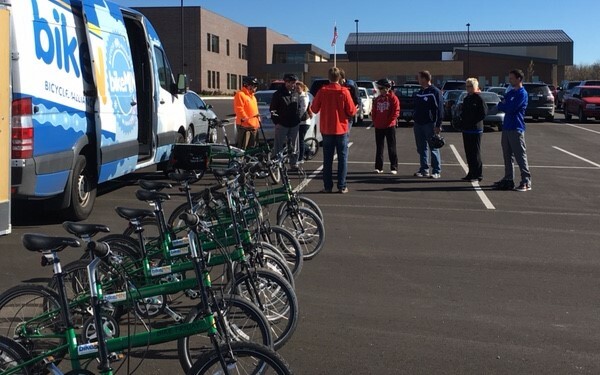 These folks will now have the chance to provide kids with critical safety skills that they’ll use for a lifetime and will help them to become healthier individuals!” said Michelle Kiefer, Safe Routes to School Program Manager with BikeMN. The Bicycle Alliance of Minnesota (BikeMN) is working to make Minnesota a place where bicycling is easy, safe, and fun for everyone. The mission of BikeMN is to unite and strengthen bicycle advocacy, provide education, and work for a more bicycle friendly Minnesota. Visit www.bikemn.org for more.